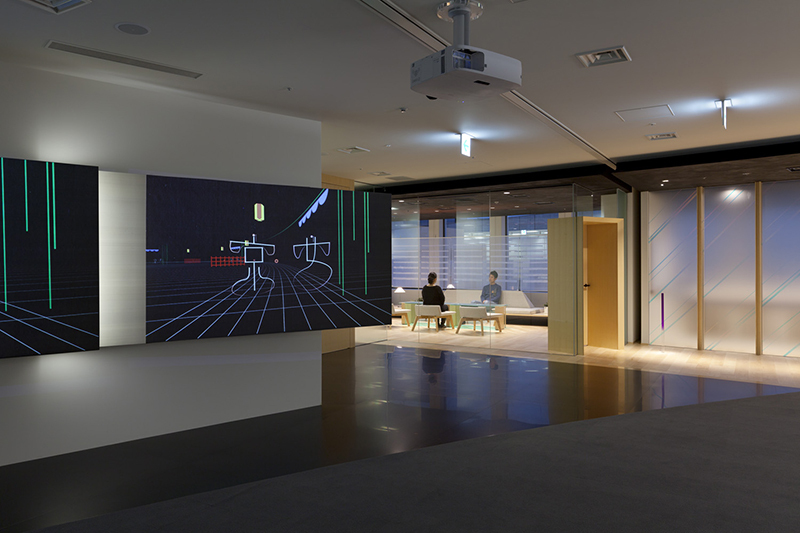 We designed the meeting/presentation area and ofce space for Cool Japan Fund, a public-private fund supported by the Ministry of Economy, Trade and Industry. 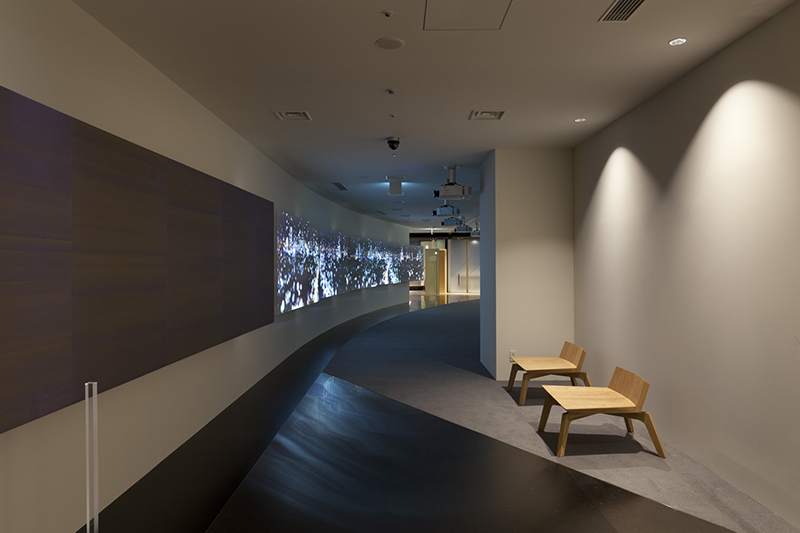 Based on the concept of “幽玄/yūgen,” the space is planned to achieve maximum acoustic efects using digital technology, and features details that employ traditional Japanese methods. Yugen has a continuous, associated meaning that starts with “unrealistic beauty before anything is settled.” This gradually evolves into “innocent beauty,” “the process of change,” and “ruined outcome (which also imply birth/growth/death).” The term as a whole suggests beauty in things without shape―moment of eclosion, germination and bloom, adolescence, sunrise, etc. 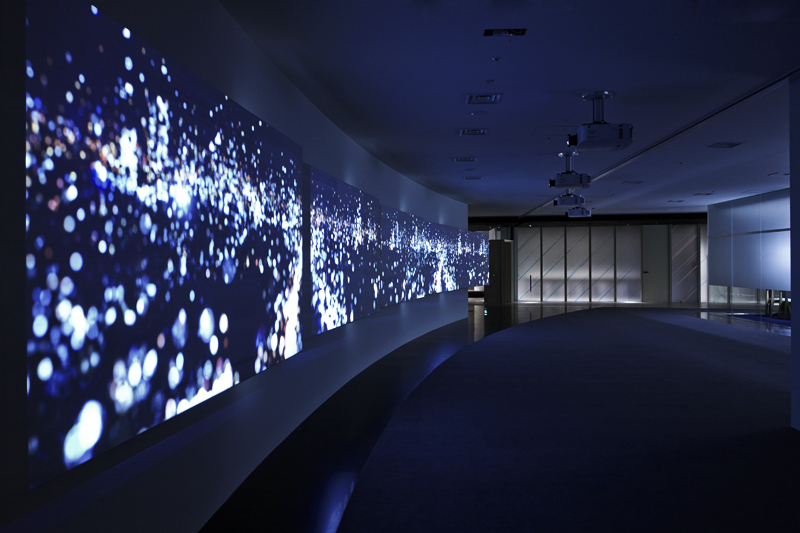 Supporting the shapeless, newborn ideas that foat in a cloud of yugen―we believe that this concept aligns perfectly with the theme of Cool Japan Fund, and based the spatial design on a yugen motif using materials and elements that employ Japan’s traditional techniques. 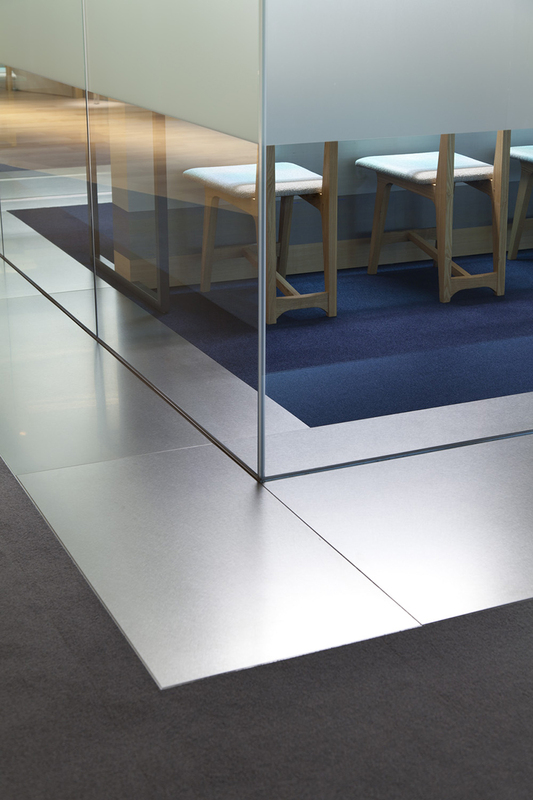 An “entrance into yugen” designed with 16 vibration speakers embedded in stainless steel fooring. 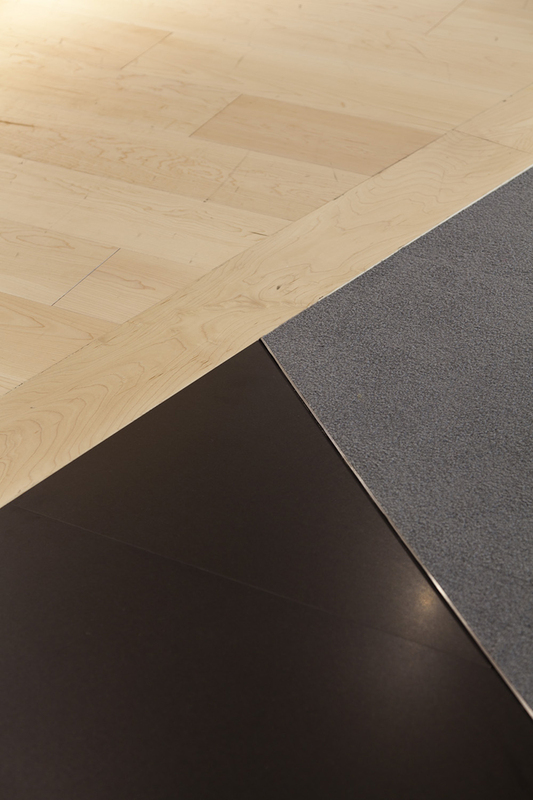 “Steppingstone,” a new sound installation piece by sound artist evala. 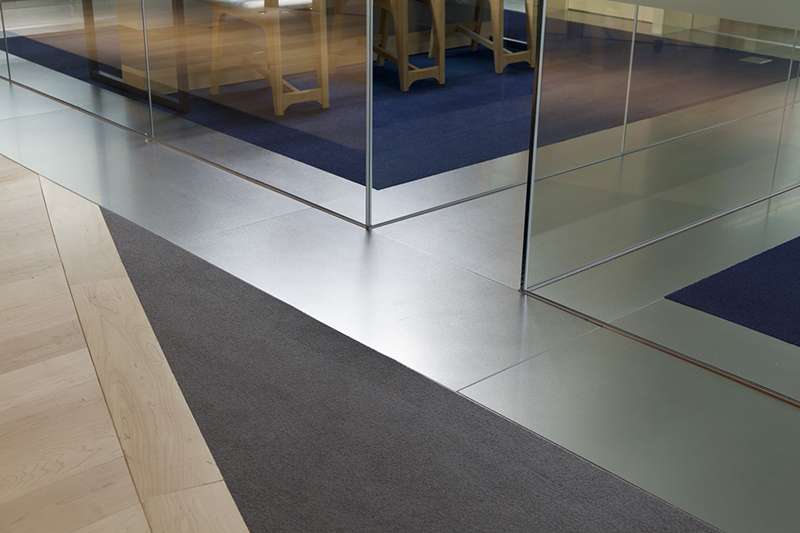 Like stepping stones that entice the visitor into a Japanese garden, this space is enveloped in sound and vibration that create a quietness that is neither artifcial nor natural. 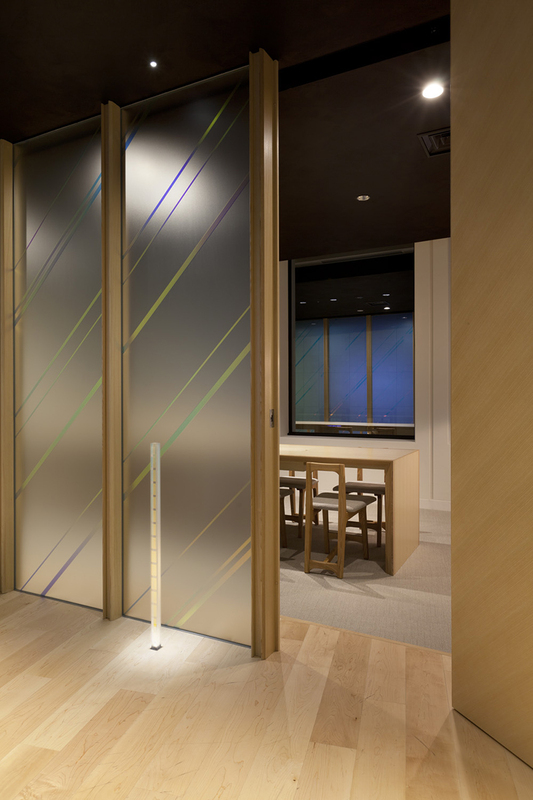 Kinufushi is a wall paper made of 100% Nagano silk fabric that has been lined with echizengami, a type of Japanese washi paper from Fukui prefecture. 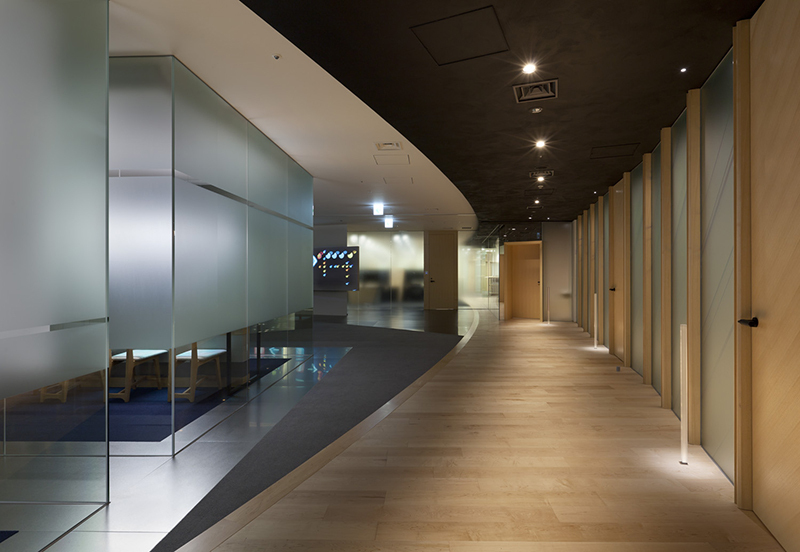 Kinufushi is a functional wall paper that not only breaths well, but retains and absorbs moisture at the same time. Thick threads of the weft create an uneven weave, giving each piece of paper a unique appearance. From dyeing of the silk to fnishing touches, each piece of kinufushi is carefully handcrafted. This meticulous handiwork creates the distinct sheen of natural silk that catches light in diferent ways under changing light. Today, there is only one family of three artisans who produces Kinufushi paper. 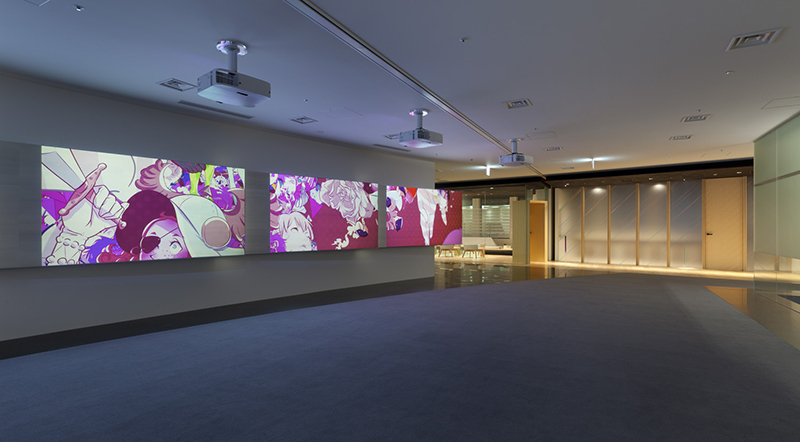 The space is designed as a gallery to showcase art, movies, animation, and other leading media art, as well as an area for hosting shows and events. 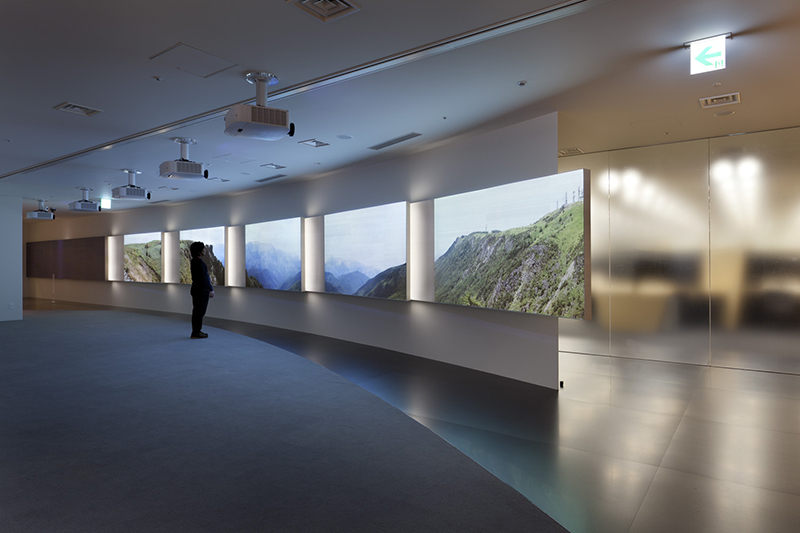 The gallery currently features digital art pieces by fve diferent artists, with works that synchronize sound with the space’s indirect lighting. 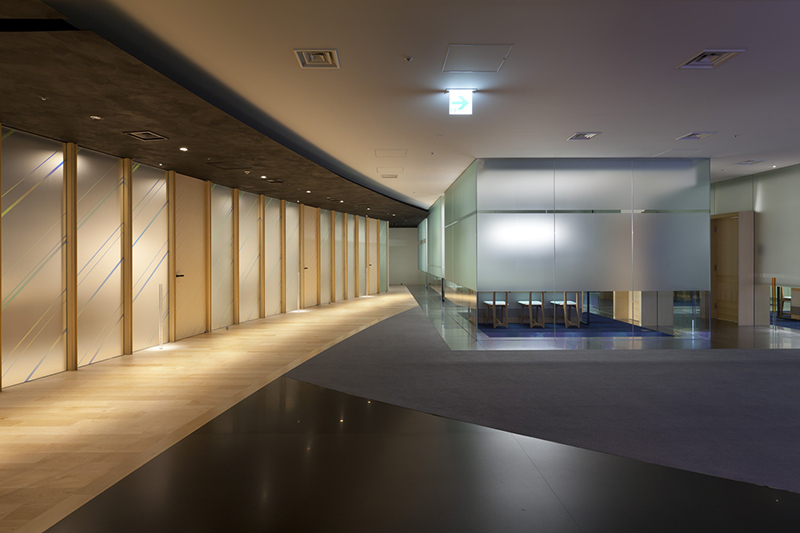 Japan is internationally recognized for its acrylic processing techniques. This sign post is made by combining colored with clear acrylic material, then shaving the colored acrylic to achieve a delicate gradation. The shaving technique featured in this acrylic post is an example of Japan’s expert skills and craftsmanship. 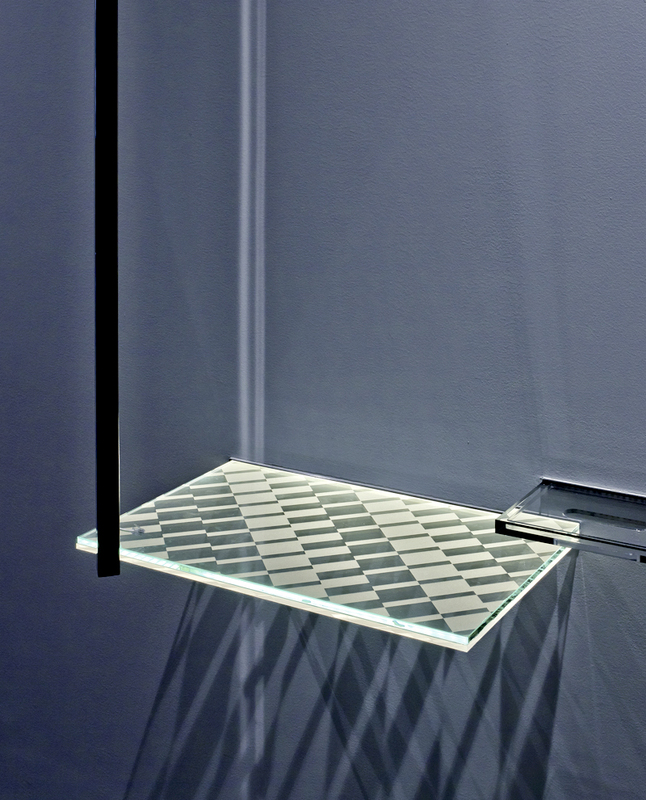 This acrylic post is one of our proposals to reinvent ready-made goods into creative renderings. 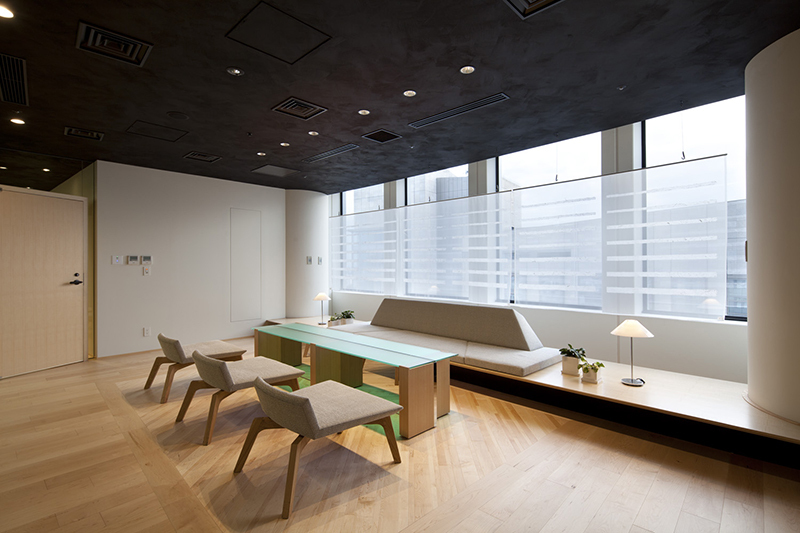 The space is designed with elements of a Japanese garden: stone = sofa, water = table, clouds = screen. 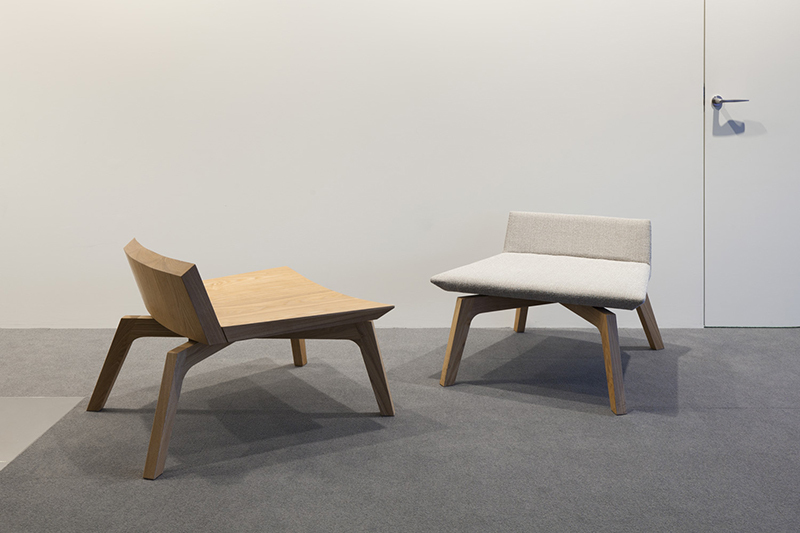 The sofa uses two types of urethane for its back support―frm urethane to preserve the sharp edges, and soft urethane for comfortable seating. 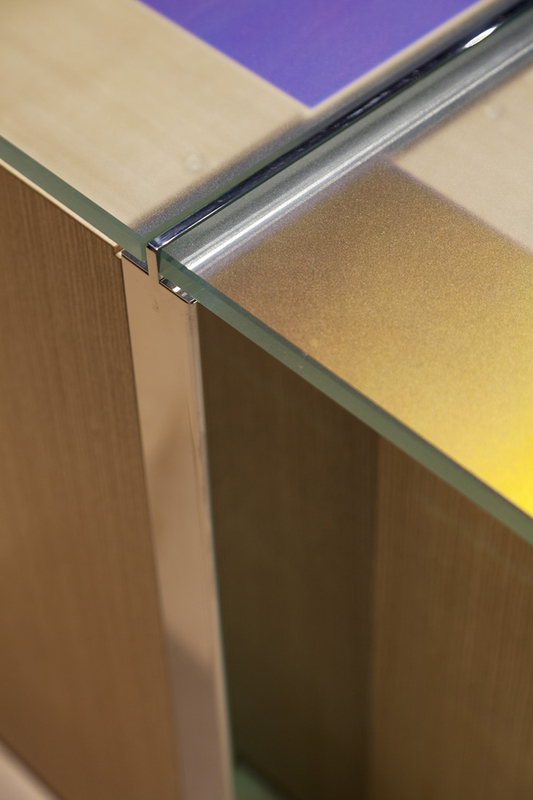 This desk features meticulously designed details, such as the interlock between the wooden legs and glass top, and mirrored stainless steel in the skirting boards. 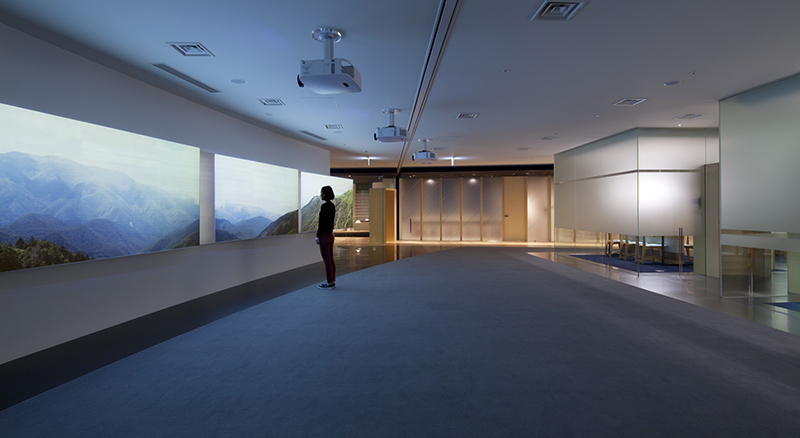 Screens were made by bonding organza fabric with custom-design washi paper. 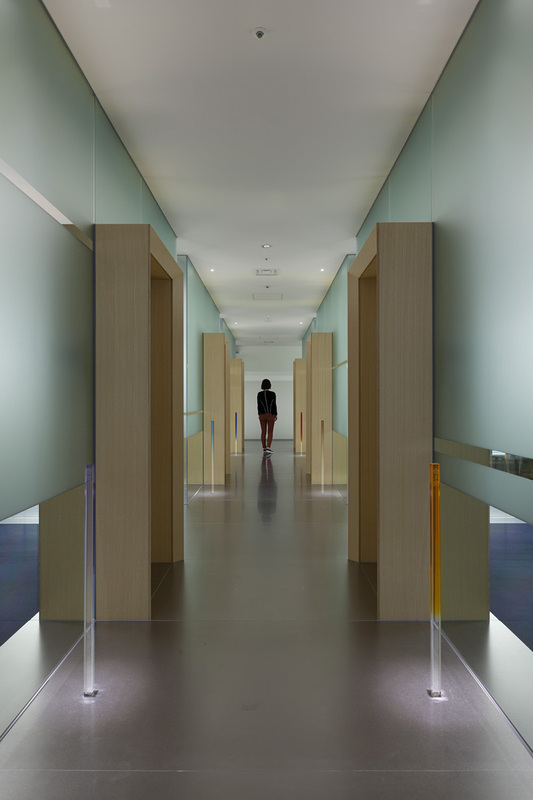 These screens exude a distinct handmade quality by combining washi’s organic fbers with the plain, artifcial feel of the organza. 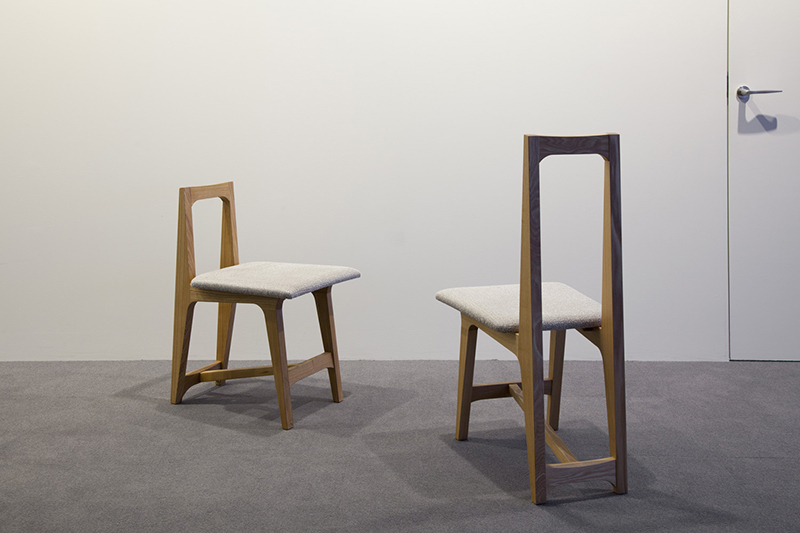 Within wooden furnitures, chairs and tables are separately categorized as “legged furniture.” Artisans of this category are specialized in creating legged items, and must have the ability to consider not only comfort, but the entire creative process including upholstery. 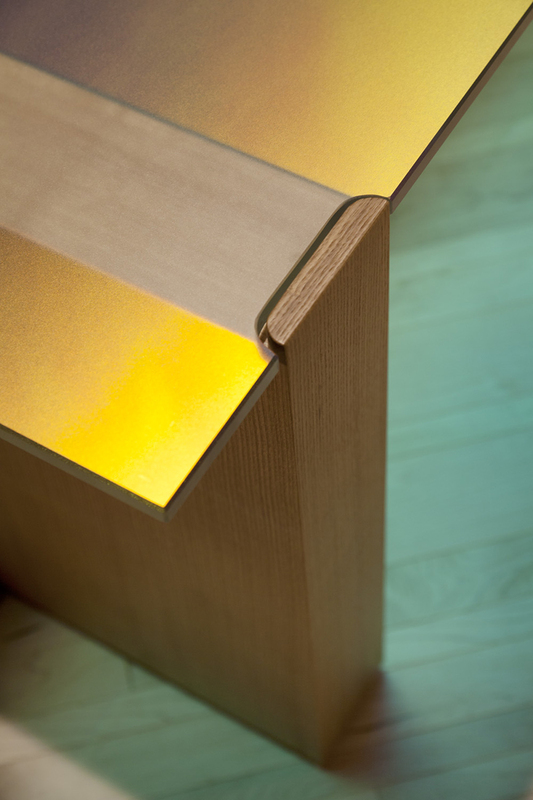 These types of furnitures must be imagined not only on a two-dimensional plan but in 3D as well. 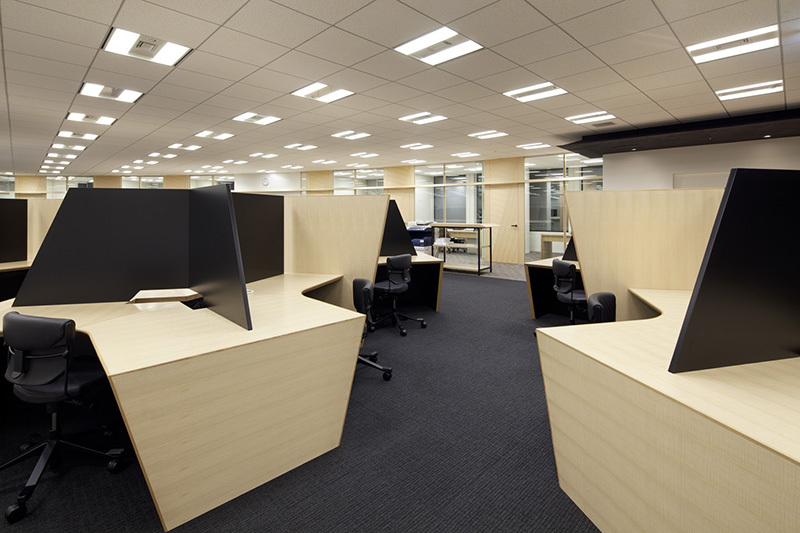 Artisans in this feld must have experience, appreciation for design, and ability to achieve functionality. 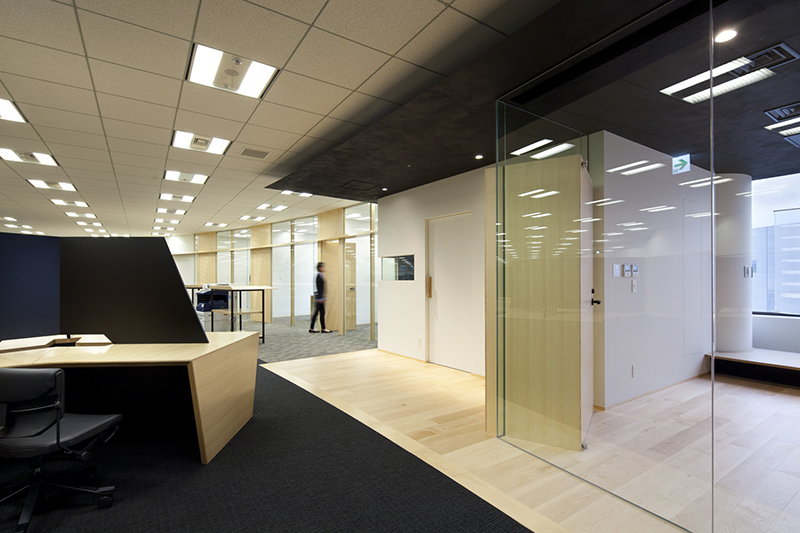 Partition walls are designed using Japanese architectural elements such as the eaves (black) and support beams (wood). 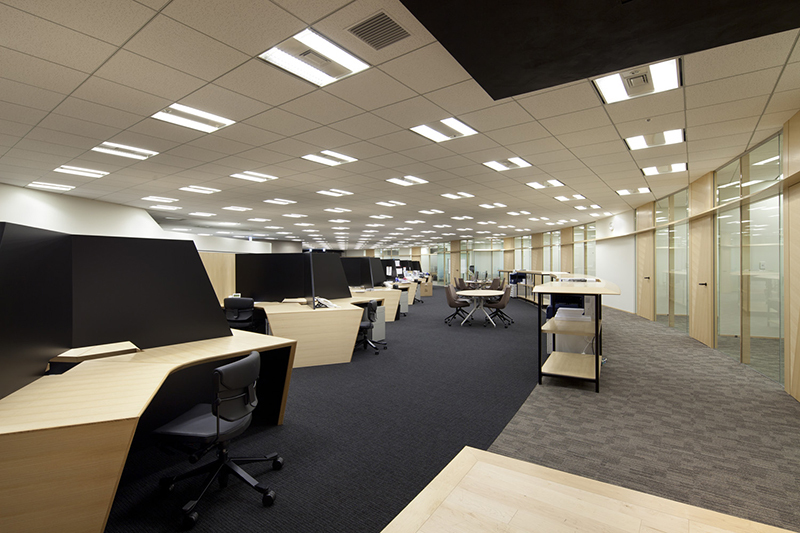 Meeting spaces are designed after paper lanterns. 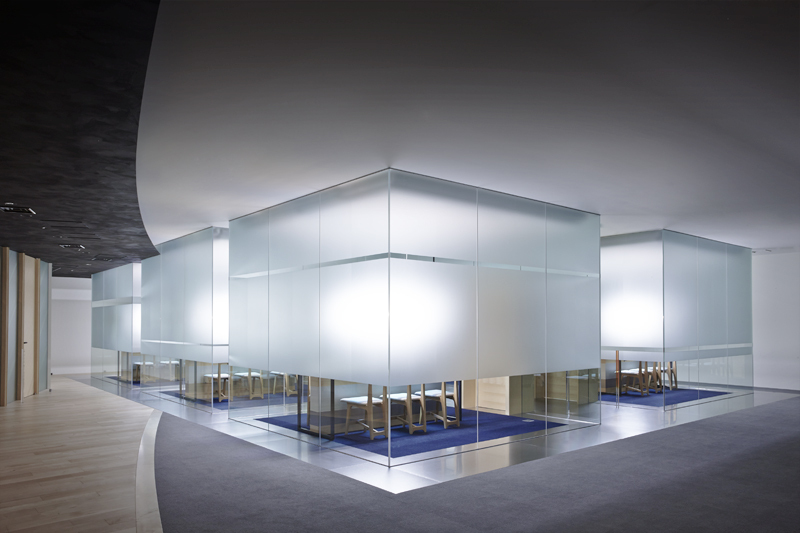 As a place of yugen, we disturbed the spatial boundary by accentuating the glass with a foating efect. 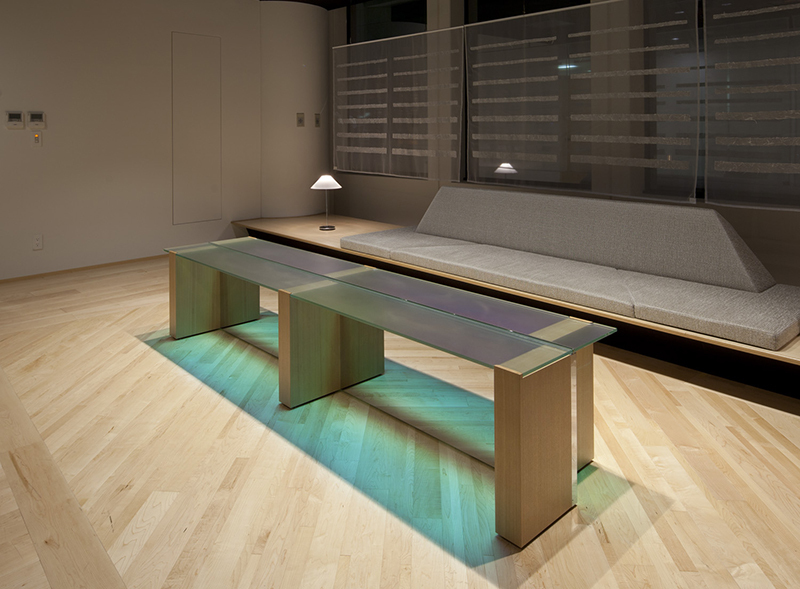 These tables, which feature an integration of various materials, are products of collaboration between traditional craftwork and leading surface fnishes, including wood, metal, glass, kinufushi, and hologram sheets. 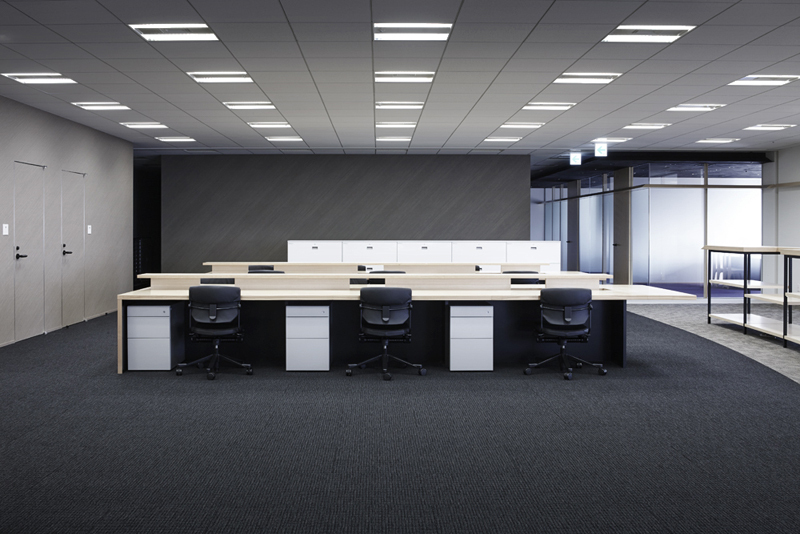 They exemplify t.c.k.w’s specialty in assembling various techniques and materials into a single product. 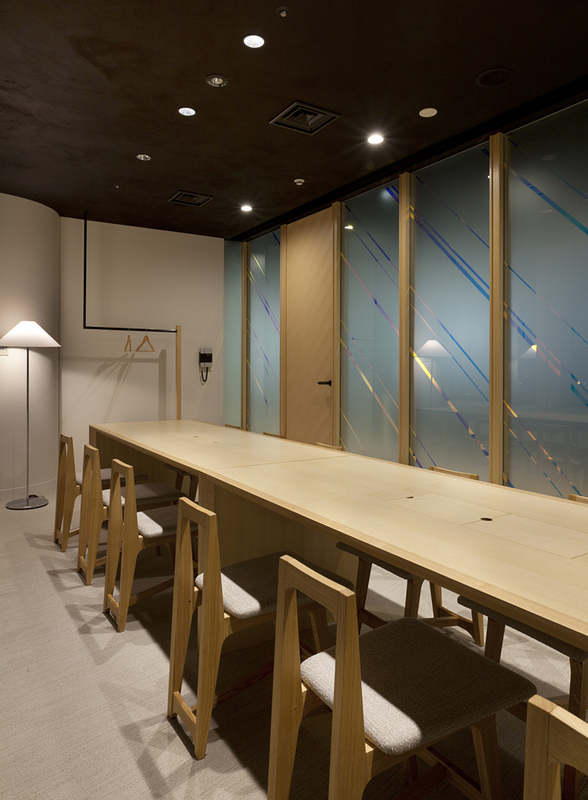 These meeting rooms are designed with Japanese architectural elements such as the eaves (black) and support beams (wood). 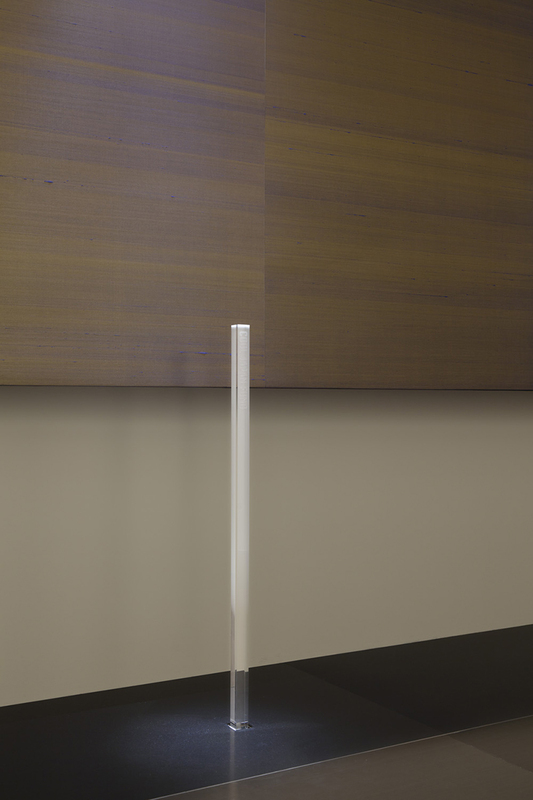 Diagonal lines are polarized flm strips that change color according to the diferent angles of light. 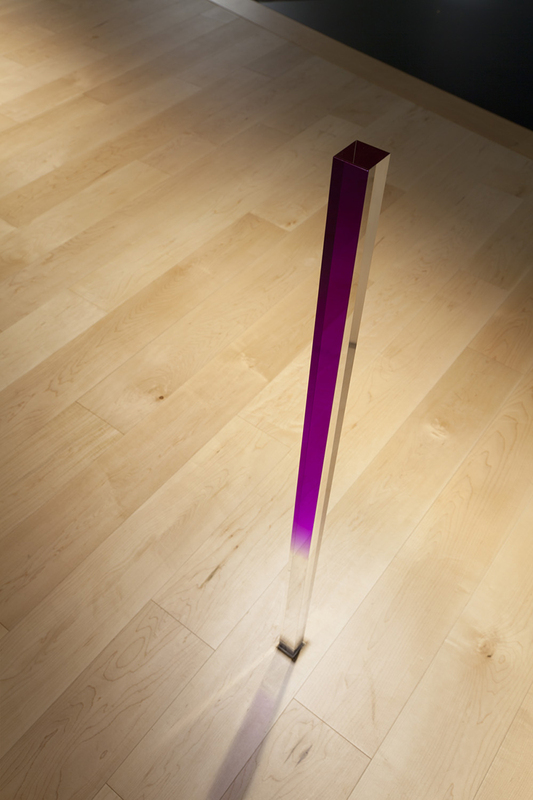 Shifting refections are another example of yugen.